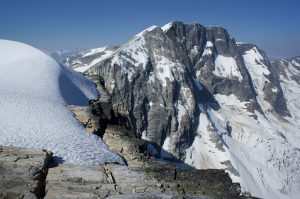 Mount Bonney is a striking sight from Asulkan Ridge, its sheer north face rising above and between lobes of the heavily-crevassed Bonney Glacier. After the MacDonald experience, I was looking for something a bit more moderate, and Bonney is one of a few less-visited peaks that does not require crossing the Illecillewaet Névé. While it looks fairly flat and tame, and there are some very interesting looking routes on the other side (e.g. north and east ridges on Mount Fox), it looks like 4-5 miles each way across the Névé, with an uncertain dismount across the glacial tongues on its other side. I got an early-ish start around 5:30, hiking the familiar Abbott Ridge trail and talking to myself occasionally to warn the bears. As the trees began to thin, I looked back and was startled to see someone slowly catching me. I wasn’t in full race mode, but I am not used to being caught on climbs. The person turned out to be a fast local, out with a friend for a quick morning run across Asulkan Ridge. He assumed that I was doing likewise, and was a bit surprised when I told him I was headed for Bonney. He had skied it in the winter, but never scrambled it in the summer. 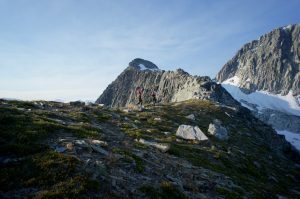 The three of us talked as we scrambled up a shortcut to Abbott Ridge, discussing local scrambles and speculating about a reasonable FKT for Sir Donald. We parted ways at the saddle before Abbott Peak, where I descended to fill up my water at the tarn before beginning the traverse around Asulkan Ridge. There may be a good line around to the Lily Glacier, but I didn’t find it. After gaining Afton’s northwest ridge, I generally stayed between 7300′ and 7500′, I performed a long, laborious side-hill on a mixture of slick heather, hard-packed dirt, krummholtz, and a bit of lose talus. I more or less kept pace with my companions on the ridge, who appeared occasionally silhouetted against the eastern sky. I finally reached Lily Col around the same time they reached the nearby summit of Dome, making me wonder if it would have been faster to follow Asulkan Ridge over the Rampart. 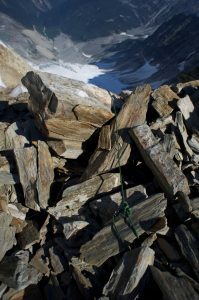 From the col, I climbed a mixture of snow and talus until I could make my way left to Swanzy’s slabby upper east face. This was the best climbing of the day, a moderate slab with cracks and positive rails. Below the overhanging summit knob, I traversed left until I could ascend a chimney to the summit plateau. I tagged the cairn on the rock highpoint to the right, then, after failing to traverse around the edge of a weird little summit glacier, walked carefully along its crest, which is higher than the rock summit. Next up was Clarke Peak, which is basically a false summit on the way to Bonney. I descended a mixture of snow and rock to the head of the Clarke Glacier. Near the head of the Tuzo Couloir, I found a uniquely sketchy anchor: accessory cord tied around a foot-long flake of rock, which had presumably been wedged between some other boulders, with the other end of the cord extending over the lip of the partly-melted ice gully. Christian Bohren had guided Heniretta Tuzo up this couloir in September 1904, probably cutting steps, back when the glaciers were larger and the snow deeper. 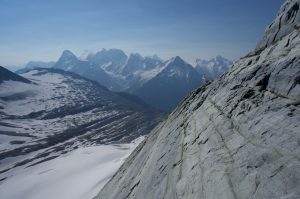 I climbed a mixture of snow and off-white quartzite along Clarke’s ridge, staying warily away from the corniced edge. Unfortunately the well-behaved rock ended at the summit, replaced by chossy, clinking dinner-plate shale. I also had to cross a small extension of the Clarke Glacier that reached the crest. I did not quite need my crampons, but it reminded me why I have been carrying them around — without them, it only takes a short stretch of low-angle ice to ruin your day. Bonney has two equally-high summits, and I found a register canister on the second. Along with the lid of a mackerel can from 1974, I found a nice book left by a party in 1988, celebrating the centennial of the first climb. 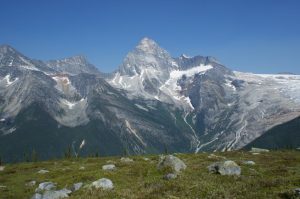 The first ascenscionists were two Anglican clergy, Reverends Green and Swanzy, and Reverend Northcott of Revelstoke had been inspired to repeat the climb. For extra style points, the centennial party had used the original route, a savage bushwhack up Loop Creek to Bonney-Green col. Somehow the register was dry and in excellent shape, despite being protected by only a non-waterproof metal canister and a produce bag. I guess not many people climb Bonney in the summer, because no one had signed it since the 1988 party. I added my name, then sat back and relaxed in the perfect weather. I had contemplated continuing the traverse to Bonney-Green Col, where I could get around the bergschrund and crevassed glacier, but the rest of the ridge didn’t look interesting, and I would have to traverse a lot of moraine and polished slabs on the long return below the Bonney and Lily Glaciers. Instead, I retraced my path, mistakenly taking a slightly lower and worse line below Asulkan Ridge. I rinsed my face at the tarn, where I met a young New Zealander on a year abroad. I encouraged him to visit the Tetons when I heard he was headed down to the Yellowstone area, then left him to scramble down the shortcut and jog the trail. 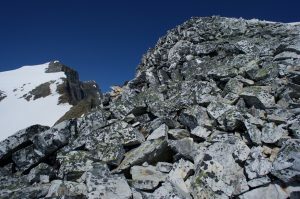 At a bit over 10.5 hours crossing some rough country, this outing wouldn’t appeal to everyone, but I enjoyed tagging a seldom-visited summit with a bit of interesting, moderate scrambling. nice one Sean! stoked to read about your day, it was awesome to run into you on the way up Abbott Ridge. U still around Revy? I’m headed out today, after doing Sir Donald yesterday. 2:24:45 up, 4:38 round trip. Get after it!